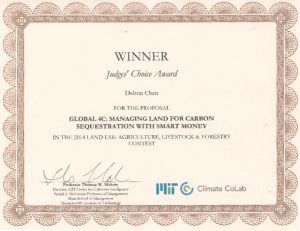 A proposal authored by Dr. Delton Chen, and sponsored by CRCS, has won in the 2014 MIT Climate CoLab Competition. 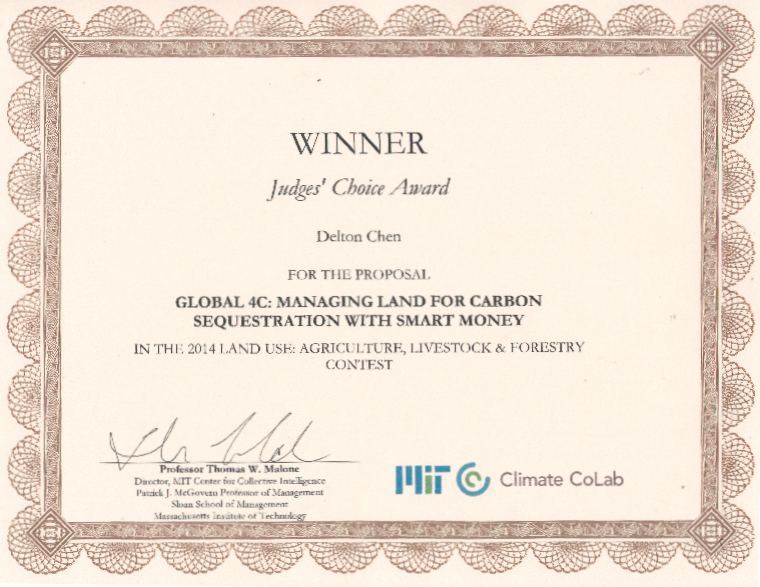 The Global 4C proposal was not the winner of the final prize, but it was a winner and very well received and recognized at the conference. The conference itself — or at least the part we were present for — was itself quite fascinating, and remarkable for the variety of entries, the keynotes, and of course the conversations in the halls. We were unfortunately detained in New Jersey for a crucial meeting on Thursday morning (which turned out well, advancing the cause of PACE financing in New Jersey), and then set off for Boston in drenching rain, poor visibility, and at least four major accidents along the way. Harrowing. We finally made it around 3:45 to the venue, and got to the breakout room for your presentation just as you were answering the last question. People felt the proposal was serious and well thought-through, and were happy to speak with us about it. The videos, and above all the new radio interview, linked below, have made the idea very clear and accessible, so we no longer have to spend much time clearing up misconceptions. I learned that the CoLab itself is a project of the Center for Collective Intelligence (which earlier this year held a full conference on collective intelligence) and is thus seen as part of a larger experiment in global thinking. In keeping with this, the major focus of the CoLab conference was as much on how to communicate the problem and the potential solutions than necessarily on the solutions themselves. Anthony Leiserowitz of the Yale Project on Climate Change Communication talked of the results of public awareness studies in the U.S. and around the world, reminding the audience that many people, especially in some of the developing countries most impacted, are still totally unaware of the idea of climate change (though when communicated they recognize it immediately as what’s happening). The final prize winner was a proposal for green building job training, a pretty conventional idea, and one of the honorable mentions went to a “collaborative solutions communication platform” being tried out in Tanzania, mainly via radio, addressing local impacts and solutions. The final keynote, by Jeremy Grantham and his daughter, focused on a number of key concerns identified in part by Grantham’s lifelong study of the world commodities markets, such as waste and misuse of phosphates, soil depletion, and food and energy impacts. The only policy proposal to win an honorable mention was for a “pro-growth carbon tax,” again a wholly conventional idea. Nonetheless, Global 4C is featured prominently on the Climate CoLab home page, http://climatecolab.org (fourth from the top as of this writing). The winning proposal is here: http://climatecolab.org/web/guest/plans/-/plans/contestId/1300205/planId/1305321. And there were a number of other proposals which might prove in some way to be related. So I feel the effort was wholly worthwhile, and we can now build on what has been accomplished. This entry was posted in CRCS, Energy, Money, News, Sustainability. Bookmark the permalink.